Would paint the sky in smoke. And crush with cannon fire. The people’s need was dire. An empty tank left bare. She drove the tank somehow. And girls go hand in hand. 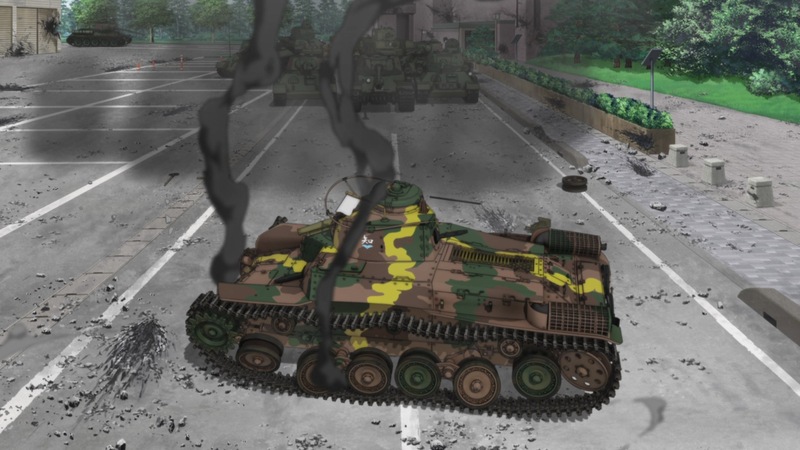 Anime has given us a lot of weird and wonderful concepts over the years, the kind you should just enjoy for their silliness and not think about too deeply, but making tank warfare a girl’s sport takes the cake for me. Even though I’ve never been particularly fond of tanks or the cute girl genre, Girls und Panzer was an admittedly fun ride, made even more fun by its big-screen follow-up. 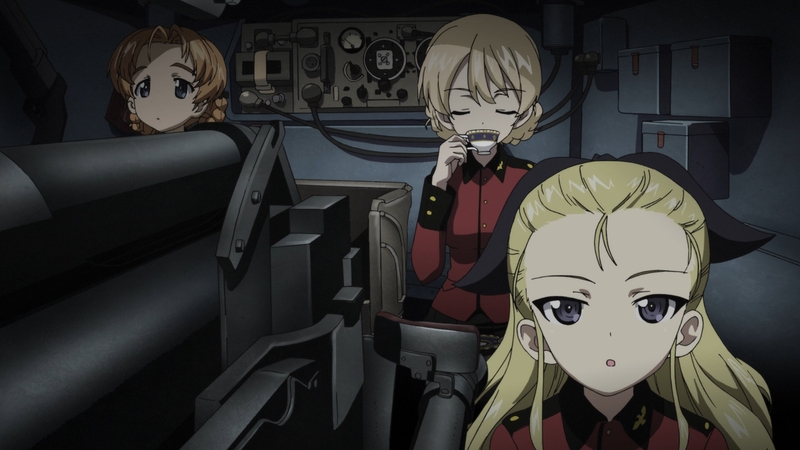 The 2012 TV series featured a ragtag group of girls from Ōarai High School rallying under the leadership of skilled but reluctant transfer student Miho in order to win a series of tank war games and stave off the closing of their school and town, which happen to be on top of a giant aircraft carrier (yes, really). 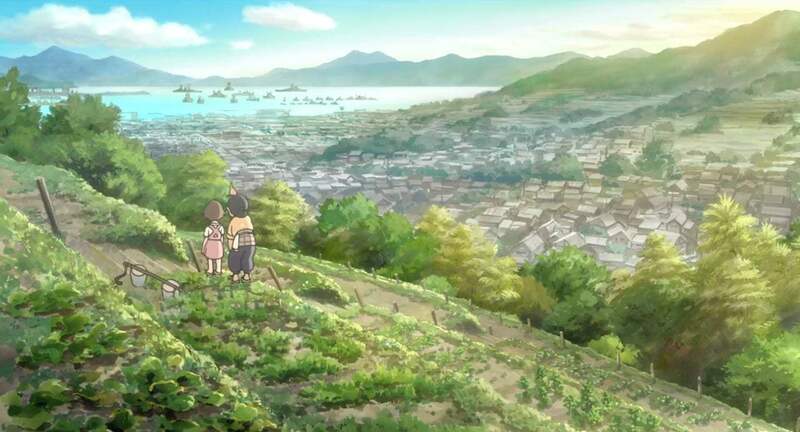 The characters are simple and likable, with most development reserved for Miho and her four closest friends. The rest of the vast cast gets the most basic development possible as members of other clubs that nonetheless contribute to the tank warfare, which seems to use real ammunition and has no regard for property damage, since the government underwrites everything as an official sport. The set-up is enjoyable enough, but the real draw here is the tank battles, explosive clashes between war machines that are depicted with surprising historical accuracy for the most part. At only twelve episodes long, the series is short but doesn’t lack thrills, as the underdog Ōarai team faces off against more accomplished high school teams that each conform to the trappings and tactics of a different nation (Americans, Russians, Italians, Germans, etc.). If any of this sounds entertaining, go watch it because it’s nice and short, and I’m about to spoil the ending. It’s probably no surprise, but Ōarai wins. Yet the movie doesn’t let that victory stand for long; one exhibition match later, the government is eager to shut the school down again, putting Ōarai in the exact same position of betting their school’s fate on a giant tank battle, this time against a University team. With this battle, however, they’re so hopelessly outmatched that their former rivals beaten during the series come to their aid and take part in one big tank free-for-all. Like the series, there is some confusion at times over who’s in which tank, and what’s happening is not always as clear as it should be. Yet the battles are still quite well planned, putting different styles of tank to good use and employing some very clever strategy along the way. (One planning session between the allied teams is like an argument between the tactical methods of all the major countries of World War II.) While the show had some semblance of realism in the tank’s capabilities, albeit small, the movie goes full-out bonkers with tanks flying through the air, sliding down rollercoaster tracks, and zooming around like high-capacity bumper cars. Some of the casualties would carry more weight if anyone was actually in danger, but that apparently never happens in this sport, and it’s perfectly fine to stick your head out the top hatch while being shelled (really). This isn’t the first anime film I’d recommend to anyone, but it’s now high on my list of guilty pleasures just for how gleefully crazy and bombastic it gets. By the time the battle moves into a theme park to use the rides as unconventional weapons, I was just enjoying the outlandishness of it all, and finding unexpected satisfaction with every enemy tank disabled. Sure, it’s silly and predictable, but that’s sometimes the very definition of fun. There’s a whole future series of films planned, but it’s hard to imagine how they’ll top this one. The peaceful prime for war. With much to answer for. Perhaps the most surprising thing about these new Planet of the Apes movies is how good they are compared with how bad they could have been. Think about it: apes using sign language, sparse and simple dialogue, “monkeys riding horses,” as Everybody Loves Raymond once put it, concepts that could so easily become laughable. And yet both Rise and Dawn of the Planet of the Apes raised the bar for what this science fiction series could be, and 2017’s War for the Planet of the Apes continued the high quality and stuck the landing, so to speak. 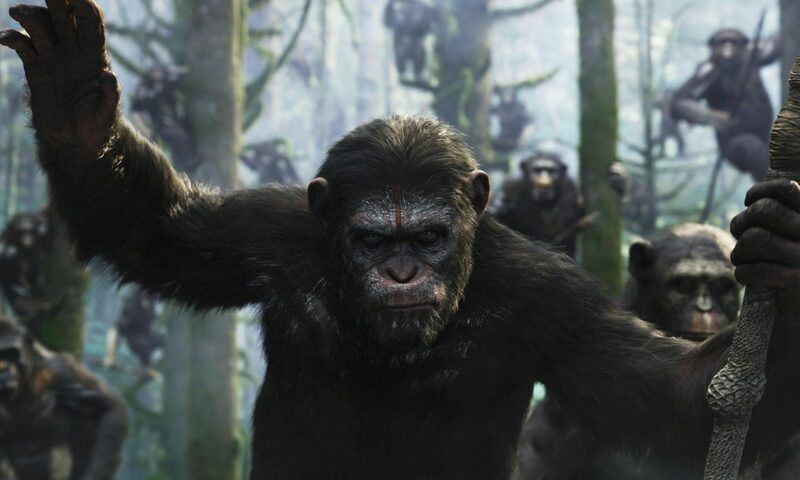 Picking up two years after Dawn, this end to the trilogy sees Caesar (Andy Serkis) and his band of intelligent apes embattled with a military garrison led by the fanatical Colonel (Woody Harrelson, in grand villainous mode). There is plenty of wreckage still from Koba’s uprising in Dawn, from defecting gorillas siding with the humans against Caesar to the emotional baggage of Koba’s and Caesar’s actions. When the Colonel exacts a personal toll on Caesar’s family, the ape leader starts to share in Koba’s hatred and soon sets out with his most loyal friends on a quest for revenge. The story morphs several times as it goes, from western-like journeying through snowy mountains to brutal incarceration to a thrilling prison escape tale, all while following Caesar’s emotional rollercoaster and completing the allegorical Moses narrative begun in Rise. 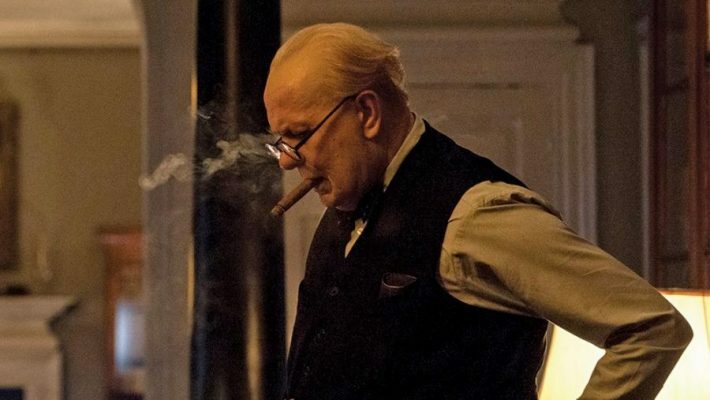 With each film in this trilogy, the visual effects have gotten more and more polished. The previous two still had moments when I could tell the apes weren’t real, but War makes them as realistic as any effect I’ve seen. Even if motion-capture technology is perhaps not entirely perfected, it’s jaw-droppingly convincing at this point, which allows the apes’ emotions to be as clearly conveyed as any of the human characters’. The characters behind that effects façade are also better defined here than in prior films. The chimp Rocket and orangutan Maurice have been with Caesar since the first film, and while they barely registered in Dawn, the fact that they join Caesar on his trek allows them to stand out better from the rest of the apes. Also joining them is the eccentric Bad Ape (Steve Zahn), a zoo escapee who adds some much-needed humor to an otherwise bleak tale. 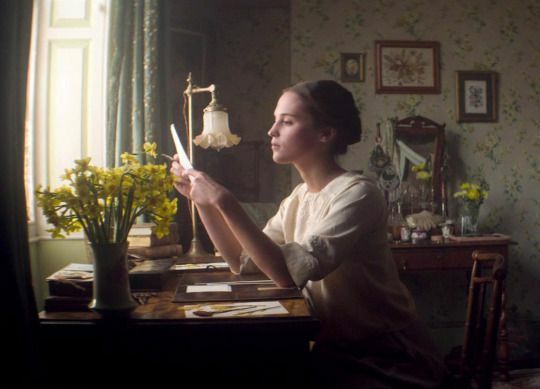 My VC has had a more restrained appreciation for these movies, admiring the visual skill but finding the execution a bit plodding and slow-paced. Even so, she found the story of War to be the strongest of the three, and although I prefer Dawn, War had the clearest character arc of the three, continued the subtle references to past movies, and worked in some evidence of how the world becomes as Charlton Heston found it in the original. I agree with her that the pacing could be tighter, particularly during the grueling prison scenes, but these films aren’t content to be mere action spectacles. They instead tackle deeper moral questions and universal themes of humanity, enlivened by moments of refreshing sweetness and stunning action. They’re a rare breed of blockbuster, and if their example overran Hollywood, that wouldn’t be such a bad thing. A bridge to span the gap so wide. Yet look what trust can build when earned! Had lit the bridge and down it burned. Wow! If Rise of the Planet of the Apes was a prime reboot, Dawn of the Planet of the Apes is an exemplary sequel. It continues the storyline of its predecessor while establishing a new yet complementary scenario with far more depth than the simple “rise of the apes” concept could have had in the hands of lesser writers. Set ten years after Rise, Dawn sees Caesar (Andy Serkis) and his band of intelligent esc-ape-ees having built their own mini-civilization, hidden in a dense redwood forest, while humanity has been decimated by the same virus that gave the apes their heightened intelligence. When a band of immune human survivors stumbles upon the apes, tensions immediately flare, especially because the humans’ energy needs won’t allow them the logical course of keeping their distance. 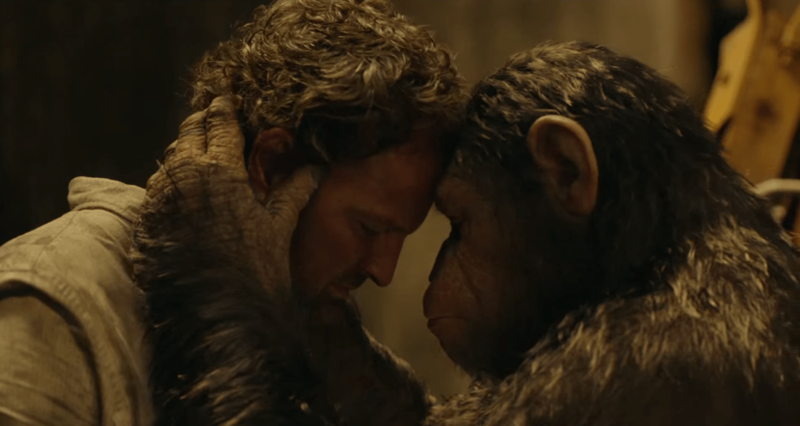 Yet the human leader Malcolm (Jason Clarke) actually tries to reach out to Caesar and his apes and work toward mutual trust, something of which apes and humans alike disapprove, especially Caesar’s second-in-command Koba (Toby Kebbell). 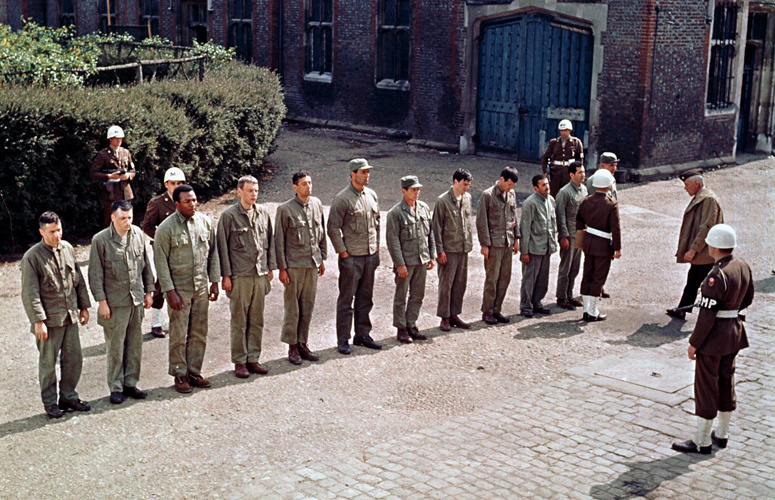 The roles of both Caesar and Malcolm are very much representative of Rudyard Kipling’s poem “If—” as they try to “keep [their] head when all about [them] are losing theirs and blaming it on [them].” They both want what’s best for their respective groups, and they know that that includes peace between them. We as level-headed viewers recognize the wisdom of their actions, and yet so many of their subordinates carry far too much baggage and resentment to trust that wisdom. Whether it be humans who automatically associate the word “ape” with the virus epidemic or surly Koba, who still hates humans for using him as a research guinea pig, they question their leader’s judgment and even his loyalties without questioning if he might be right. It’s frustrating and yet all too believable, considering humanity’s known weakness and intolerance. Another major theme is that the apes and humans are not as different as either side would think. That weakness and intolerance are common to both, as is the tendency to view such opponents as a group rather than individuals who don’t necessarily all believe the same thing. The act of a rogue can quickly spiral into “us versus them” violence that makes such perceptions harder to undo. What’s astounding about Dawn is how it gets these complex messages across with minimal dialogue, utilizing the apes’ broken English and hand motions to their fullest. The motion-capture CGI is also even more impressive than in Rise, wowing with the action battle scenes, as well as benefiting the story in less flashy ways, like the clearly recognizable emotions that play out on Caesar’s face, courtesy of the talented Andy Serkis. 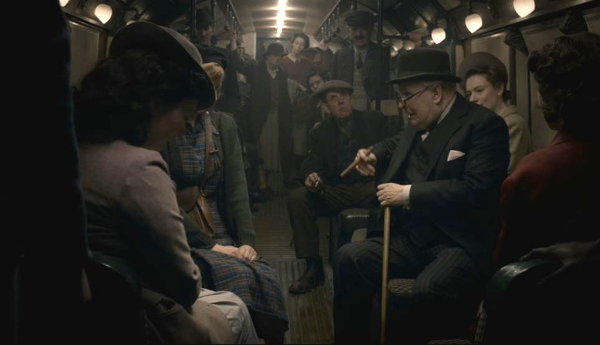 In addition to the Oscar-nominated visuals, all the performances are outstanding, especially Clarke, Serkis, Keri Russell as Malcolm’s wife, and Gary Oldman as Malcolm’s less trusting counterpart. James Franco is sadly departed from the story, but there are affecting reminders of him and Caesar’s past. Caesar’s ape friends who do carry over from Rise don’t stand out that much, making me glad I still remembered them from having just seen the first film, but Koba’s role is greatly expanded as an antagonist, with the ending directly mirroring one of his actions in Rise. Also, as a fan of tracking shots, I must point out a scene I loved in which the camera follows Malcolm as he stumbles through a maze of hallways trying to avoid invading apes. It made me think that a tracking shot could be a running element for the series, since Rise had the scene with young Caesar swinging throughout Will’s house. Dawn is a sober movie that views the ape versus human struggle with far more nuance and regret than any earlier installment, precisely because the film shows it didn’t have to turn out the way it did. An action blockbuster is expected to have awesome visuals, but it’s a rare and pleasant surprise when there’s this much depth too. With so much tension between various groups nowadays, the film remains as timely as ever, a potent reminder to not let the worst parts of our nature carry us to destruction.